For years, a battle has waged between video editing platforms Adobe Premiere and Avid Media Composer (AMC). Given the functionality and popularity of Adobe Premiere and After Effects, many companies with Avid workflows are looking to leverage components of the Adobe Creative Cloud suite—such as After Effects and Illustrator—in their creative workflows. They might also be exploring making the switch to using Adobe Premiere in their editing workflows due to its support for modern formats, graphics, and more. But anyone who has tried to integrate Avid workflows with Adobe workflows knows there is no simple solution—until now. The main issue many organizations face when looking to introduce Adobe applications is that their workflow may include Avid’s Interplay Media Asset Management (MAM) system. Because Media Composer and Interplay are tightly integrated, trying to use and manage other applications proves difficult—unless you have a MAM that can play nicely with everything. 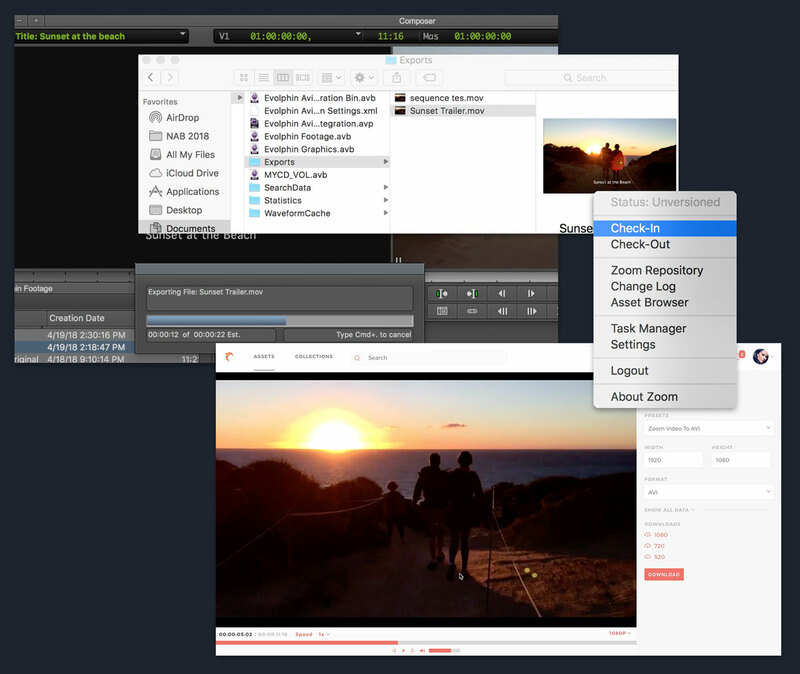 Evolphin Zoom is the most robust Media Asset Management system for companies using Adobe Creative Cloud applications. With plugins for all of the apps—Premiere, Photoshop, Illustrator, After Effects, and InDesign—assets and projects can be tracked and version controlled. Editors and designers don’t need to leave their applications to interact with the MAM to search for media to add to their projects, or to export their work for review and approval. Evolphin Zoom’s Asset Browser brings the most advanced management features to a user’s fingertips. But how does Zoom work with Avid Interplay or Media Composer? The answer is: quite easily. Just like with the Adobe apps, assets can be dragged and dropped from the Zoom Asset Browser directly into Avid Media Composer. Exports from Avid Media Composer can be synced with Evolphin Zoom with a right click menu in Finder or Windows Explorer. When using any of the Adobe apps, creatives can rely on Evolphin’s plugins for search, collaboration, and exporting, no matter which application they are using, whether it be Adobe CC or Avid Media Composer. In addition, companies with large amounts of media can use Zoom to index the media storage in-place for assets shared between Avid and Adobe CC, allowing terabytes of media to be tracked by the MAM without needing it to be manually ingested. This allows Evolphin Zoom to be set up and running with as smooth a migration as possible. Check in exports from Avid Media Composer into the Zoom MAM with a right-click, and collaborate using the Zoom web client. Zoom can also talk to Interplay’s APIs to retrieve key information or send assets and metadata between the two systems. Since Zoom is endlessly customizable, the two systems can coexist in a company’s workflow and bridge the gap between Avid and Adobe. Companies looking to integrate more Adobe apps into their workflow can use Evolphin Zoom so they don’t need to sacrifice the workflow capabilities of a MAM or give up their Avid workflows entirely. With Zoom’s leading level of automation, customization, and integrations, you’ll be in good hands.